My story about floating down the Canal du Midi in the south of France appears in No Set Boundaries: Eleven Stories of Life, Travel, Misadventure, the second volume of essays from Townsend 11, a publishing entity created by my long-term writers group. Get it wherever good e-books are sold, or download it to read on your computer or phone. Read my introduction to the book. The church steeple in the village of Montesquieu-Lauragais in the Haute Garonne of France’s Midi-Pyrénées has stood for hundreds of years. From its perch above the gently recumbent wheat and sunflower fields caressing the Canal du Midi, it has seen scourges, sieges, and the everyday life of countless generations. But tonight it looked as if it was finally coming down. 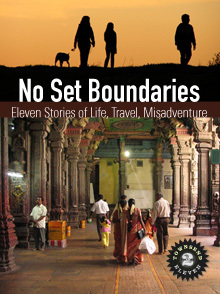 To read the rest, and ten other great stories, pick up a copy of No Set Boundaries.